Journal of Pharmacy Practice and Community Medicine (JPPCM) [http://www.jppcm.org] [e-ISSN : 2455-3255] is the official journal of Indian Academy of Pharmacists (IAOP). It is an international peer-reviewed journal. 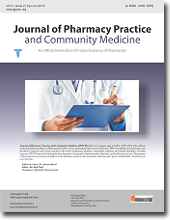 JPPCM publishes four issues per year devoted to research and review articles in the field of pharmacy practice, community medicine and related discipline of health sciences. JPPCM aims at facilitating the development of community-based research, education, and health care services. The purpose of this journal is to promote excellence in the pharmacy practice and community medicine and closely related fields. All articles are now welcome. JPPCM provides DOI (Digital Object Identifier) to each published article. All published articles are indexed in Google scholar, China National Knowledge Infrastructure (CNKI), CrossRef and under process in Directory of Open Access Journals, EBSCO Publishing's Electronic Databases, Hinari (WHO) and Index Copernicus etc. All articles published in JPPCM are made open access immediately. Journal of Pharmacy Practice and Community Medicine by EManuscript Services is licensed under a Creative Commons Attribution 4.0 International License. Based on a work at http://www.jppcm.org.